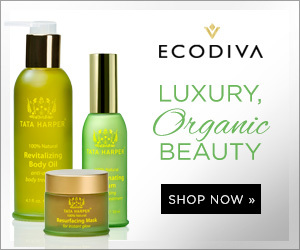 This review is on a skincare line that EcoDiva sent to me called, "Dr. Alkaitis". 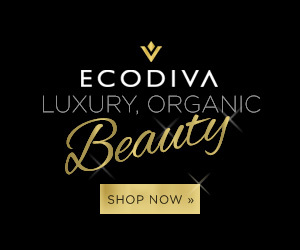 Before I begin, if you haven't heard of EcoDiva, they are an online store that allows you to order a variety of the purest, most effective and sustainable products available. They have everything ranging from makeup, hair, skincare and bath & body products. First off, I just want to show you how EcoDiva packaged me their products so you can get an idea of what your order would look like. They put your products in this gorgeous black box with a magnetic flap closure which gives this luxurious feel. Inside, all of the products are safely placed on top of a bed of shredded, crinkled, black paper which is great since those are recyclable! I had never heard of the brand Dr. Alkaitis until they sent me the products, so I did some research on the brand and I just immediately fell in love with it. Dr. Alkaitis is not just the name of the brand, but it is also the name of the creator of this amazing skincare line. He is a world-renowned scientist who actually started this brand initially for his wife. Dr. Alkaitis is a 100% organically grown, raw skincare for all skin types. Dr. Alkaitis uses certified organic, biodynamic and ethically wild-crafted ingredients in their raw state for the greatest effectiveness. Everything is made in-house; formulated and manufactured by Dr. Alkaitis himself and his products are NEVER tested on animals. His products are 100% NATURAL & ORGANIC or wild-crafted, vegan, gender neutral, chemical-free, cruelty free, contains no GMO's, and raw (unheated). "IF YOU CAN'T EAT IT. DON'T PUT IT ON YOUR SKIN"
I absolutely love this guideline because our skin is our largest organ, so whatever you put onto your skin gets absorbed into your body. Therefore, you are essentially eating the products you put on your skin anyways. The base of this product is organic castile soap, and it is a gentle cleanser. Because it is gentle, I use this as my daily cleanser on days that I don't wear makeup (which is most). On that note, this cleanser is NOT meant to remove makeup, so do not depend solely on this after a night out. I recommend using a makeup remover before this cleanser. The consistency of this toner is watery, and there definitely is a particular way of applying this. One pump into the palm of your hand is enough, and you're going to want to use your other hand to dab the product onto your face. The scent of this toner is pretty much the same as the cleanser but lighter. What I loved about this toner is that it absorbed quickly into my skin, doesn't leave a residue and it doesn't give you that "tight" feeling on your face. For those of you with oily skin, you can also use this toner in place of a moisturizer and just end your skincare there and you'd be fine since it is light, and still moisturizing to the skin. The liquid of this soothing gel is a bit thicker than the toner and it has a gel'y consistency from the aloe. I tested this product on my legs since I do shave my legs the most and found that it did soothe the skin and also added some moisture. Aside from using it for its actual purpose, this soothing gel is also great as a facial moisturizer. Right now, during the summer, this makes a great substitute as a light moisturizer (1 pump). This oil has an herbally scent but it is a super relaxing. My best way of describing it, is that it smells like a spa. I used this on my face once a week, either on a Wednesday or on the weekend to treat my skin. 1 pump was enough for my face and it leaves your skin feeling super soft, supple and nourished. This oil gets absorbed nicely into the skin and doesn't leave it feeling greasy. This day creme has a thick consistency, and I knew exactly what this product smelled like from the first whiff. The scent reminded me of POPSICLES! Yes, that's right. Now with this product, it is not really the right season for me to be using it. The creme is super moisturizing and a little goes a long way, but at the moment my skin doesn't need all this moisture during the summer. If you have dry skin, this product would be perfect for you and your skin will just eat this up! I do plan to use this creme more in the winter when I do have dry skin. With the night creme, it has a thick consistency (thicker than the day creme) and has a scent very reminiscent of sunblock. This is a great overnight treatment to get some moisture back into your skin, but like the day creme (above), I can only use this on some nights that are cooler and will mostly use it during the winter. This eye creme has the lightest consistency between the cremes in the travel kit and has a scent like the day creme just lighter. This product is amazing, I absolutely love this eye creme. It is super moisturizing for the under eyes and I find that it reduces fine lines. First off, if you are allergic to strawberries, avoid this product! Unfortunately, I do not think it's right for me to give you guys a review on this product since I don't think I was able to use it enough. This product was the only one in the travel kit where I felt that they didn't give enough of product. I only got to use the mask once, and I believe there is only enough for 2 masks. For me to give you an honest review on this mask, I feel like I would need to use this for at least a month since you are only recommended to use this once a week (and there's only enough for 2 masks). However, I can tell you about my experience using this mask, and if you do want to know about it watch my video down below where I filmed my mask experience near the end!